This walk-through creates two screens. The first is a screen called GameScreen which will define what our game will have in every level. The second is a screen called Level1 which will have only files and objects for our first level. GameScreen will be a base class for Level1, and any additional levels will also use GameScreen as a base screen. At the end of this walk-through we will have a tile map rendering in a our game. First we’ll create a screen called GameScreen. Many FlatRedBall projects contain a GameScreen which typically contains the main gameplay – as opposed to menus to set up the game. The GameScreen also contains any common objects such as lists of entities and game logic. For now we’ll leave our GameScreen empty, but we’ll return later to add objects later. Next we’ll create our first level. Levels are regular screens which inherit from a base class that contains common gameplay objects, files, and code. Set the Tile layer format to Base64 (zlib compressed). 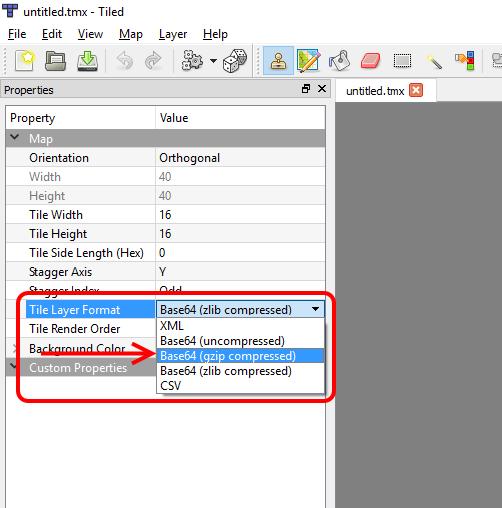 Compressing the tile map will make the .tmx file smaller. We will need to change the type of compression used in a later step, since the new file window only lets us pick “zlib”. Set the Tile size to a Width of 16px and a Height of 16px. Tile sizes are usually multiples of 2 (2, 4, 8, 16, 32). This guide uses a tile set with 16×16 tiles. Now that we’ve created a map, we will change the “Tile Layer Format” to “Base64 (gzip compressed)”. We need to make this change after we create the map because Tiled does not let us pick gzip compression when first creating the map, and gzip compression works on all FlatRedBall platforms (zlib does not). Now that the format has been changed, save the file again. 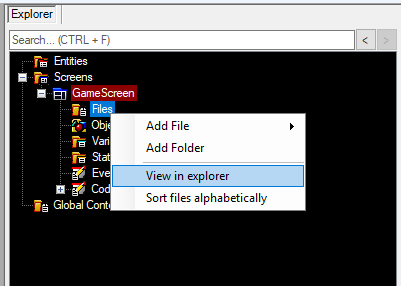 Finally the file can be added to the GameScreen by drag+dropping the file from windows explorer to the Files item under GameScreen. 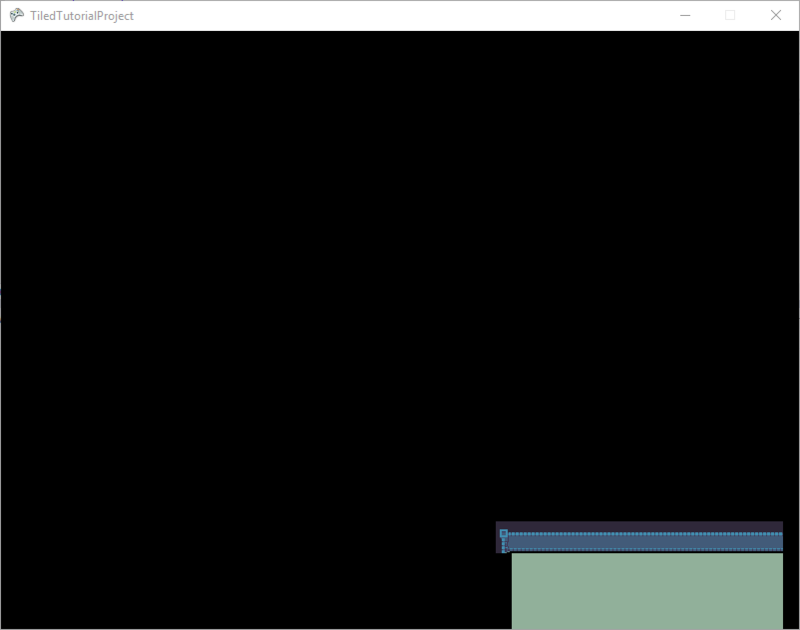 The game now references the .tmx file, and when executed the game loads the empty .tmx file. Files which are used by TMX levels should either be saved in the content folder of one of the level screens or in the content folder in the GameScreen. 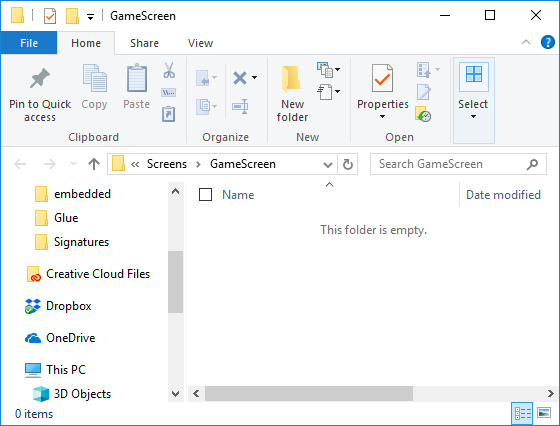 The content folder for GameScreen will be open (and empty). 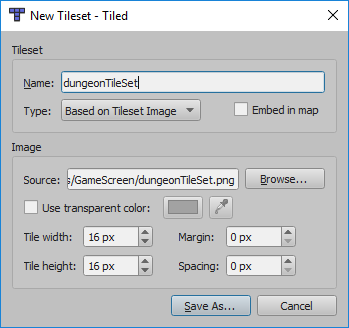 Save the tileset (shown above) to the GameScreen content folder (which we just opened). 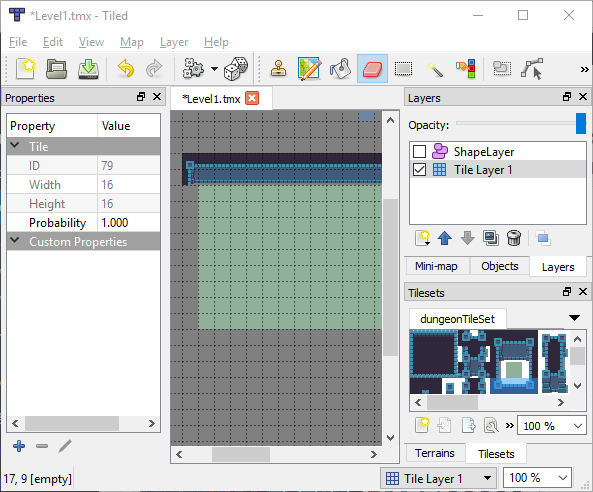 The tileset (called dungeonTileSet) will now be shown in the Tilesets section in Tiled. Each tileset must use exactly one image file. Tiled supports multiple image files per tileset, but FlatRedBall does not. Each layer in your map can only use one tileset. Tiled supports painting multiple tilesets on one layer, but FlatRedBall does not. The fewer tilesets, the faster your game will load and render. If possible, try to fit your entire game on one tileset. FlatRedBall supports textures as large as 4096×4096. 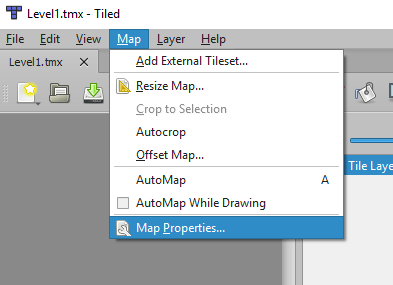 TMX files are the file format that contains the tile map. Along with the TMX file, games that use Tiled will usually reference image files (PNG) and reference external tileset files (TSX). Glue is able to track these references automatically, so only the TMX file needs to be added to your screen (as was done earlier). 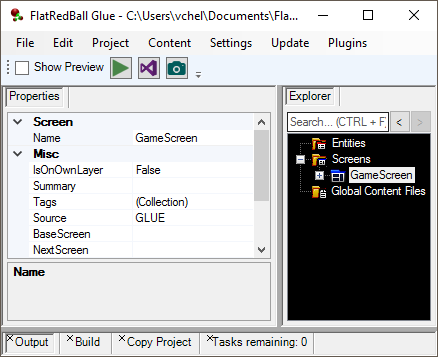 Any PNG and TSX files referenced by the TMX file will automatically be added to your Visual Studio project by Glue. 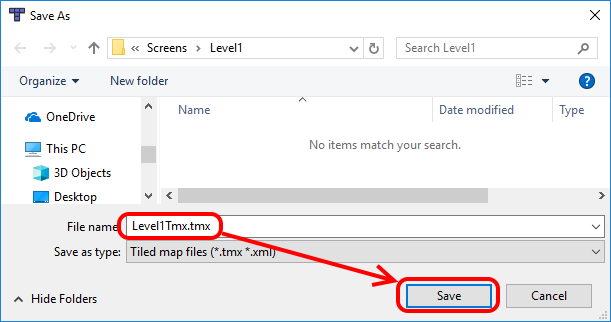 In other words, once you add a TMX to your screen you don’t have to do any other file management in Glue or Visual Studio. 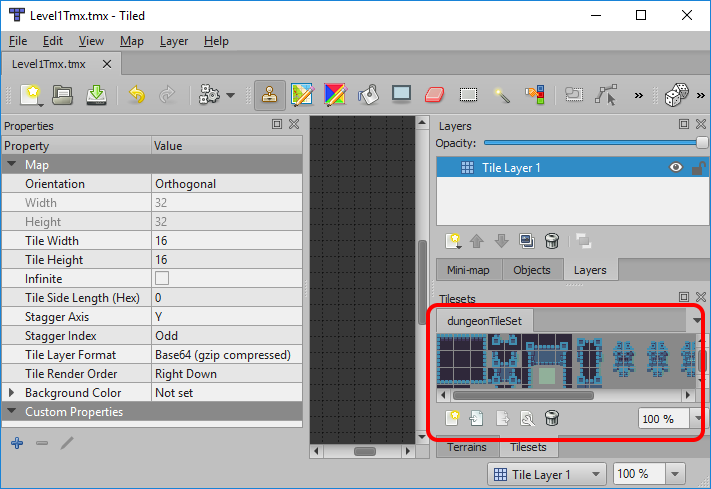 Once a tileset has been created, tiles can be placed by clicking on a tile in the tile set, then painting on the map. 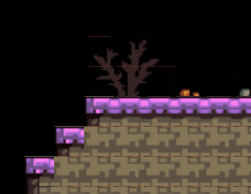 Spend some time creating a small level for your game. Keep in mind that changes made to the .tmx file in Tiled must be saved before they will show up in game. 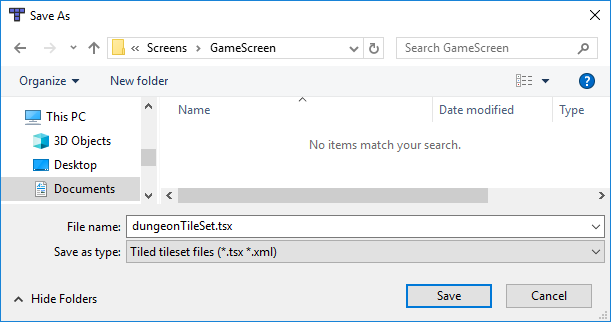 Also, Glue automatically manages files referenced by .tmx files, so we do not need to manually add the dungeonTileSet.png file to the GameScreen. Notice that Level1 is highlighted in red when not selected, indicating that it is the first screen when the game runs. Notice the file may be offset depending on which tiles are painted. This is because the center of the screen is (0,0), which is the top-left of the tile. 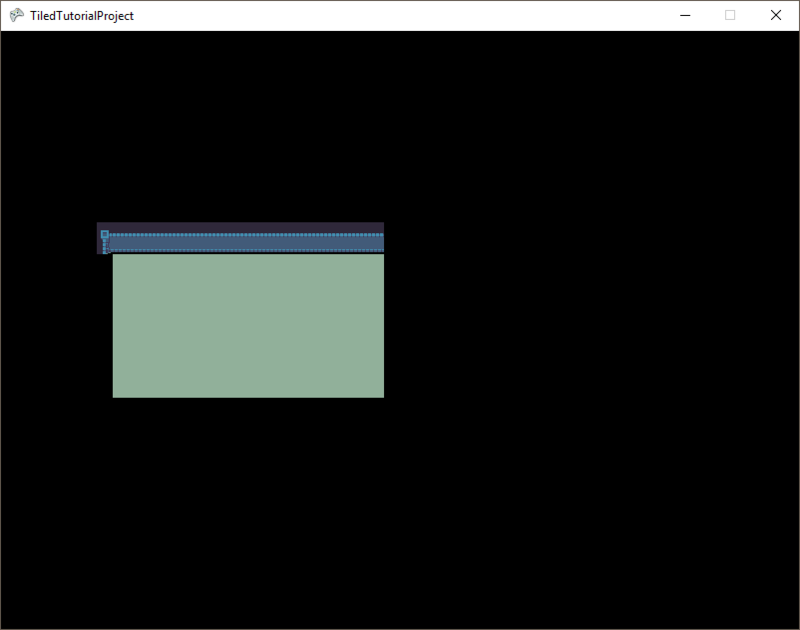 Open GameScreen.cs in Visual Studio. We could do this in Level1.cs if we wanted it to be logic specific to Level 1, but we want to have this code run for all levels. Texture filtering is a method of making objects look less-pixellated when zoomed in. Most 3D games apply a form of “non-point” linear filtering, which removes the square pixel looks of zoomed-in textures. Unfortunately, since tile maps pack each tile adjacent to one-another, this can cause lines to appear between each tile when running the game in FlatRedBall. For more information, see the TextureFilter page. 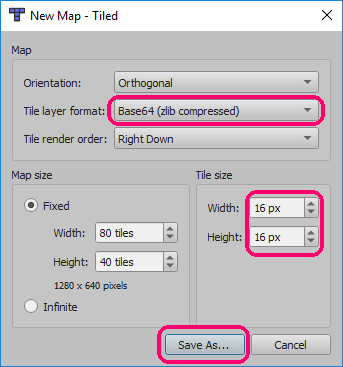 If your tile map does not appear, the following section may help solve the problem. Loaded tile maps are drawn in the FlatRedBall engine, sorted by their Z value. A single-layer map will be drawn at Z = 0, so any object with a larger Z value will draw in front of the map.